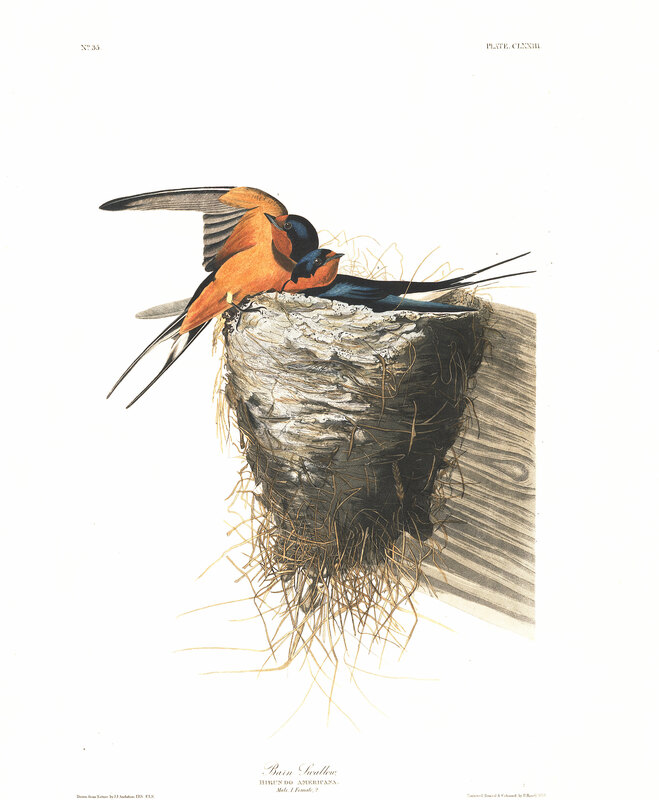 The Barn Swallow makes its first appearance at New Orleans from the middle of February to the first of March. They do not arrive in flocks, but apparently in pairs, or a few together, and immediately resort to the places where they have bred before, or where they have been reared. Their progress over the Union depends much on the state of the weather; and I have observed a difference of a whole month, owing to the varying temperature, in their arrival at different places. Thus in Kentucky, Virginia, or Pennsylvania, they now and then do not arrive until the middle of April or the beginning of May. In milder seasons they reach Massachusetts and the eastern parts of Maine by the 10th of the latter month, when you may rest assured that they are distributed over all the intermediate districts. So hardy does this species seem to be, that I observed it near Eastport in Maine, on the 7th May, 1833, in company with the Republican or Cliff Swallow, pursuing its different avocations, while masses of ice hung from every cliff, and the weather felt cold to me. I saw them in the Gut of Cansso on the 10th of June, and on the Magdeleine Islands on the 13th of the same month. They were occupied in building their nests in the open cupola of a church. Not one, however, was observed in Labrador, although many Sand Martins were seen there. On our return, I found at Newfoundland some of the present species, and of the Cliff Swallow, all of which were migrating southward on the 14th of August, when Fahrenheit's thermometer stood at 41 degrees. Male, 7, 13. Female, 6 3/12, 12 9/12.